The placement season for Batch 2016-18 has begun on a very promising note with more than 50% of the batch being placed so far. Placement of the 17th batch of IFMR students started with a bang. Companies like Accenture, Bajaj FinServ, CapGemini, Credit Suisse, Daimler financial services, KPMG and Temenos visited the campus at Sri City and made presentations on the roles and their expectations before starting their selection processes. Nearly 50% of the batch graduating in 2018 has already been placed. Some companies like CRISIL, Deloitte, HSBC and Infosys offered in large numbers in a variety of job profiles. HSBC which inducted three students last year for risk profile has returned this year to take eleven students. Students bagged roles in Banking, Capital Markets, Consulting, Credit, Global markets, Marketing, Modelling, Operations, Payments, Product Development, Research, Risk, and Sales. While no difference was observed in the way companies were selecting amongst those with and without experience, when it comes to salary and roles, those with prior work experience, command a premium of over a lakh of rupees per annum and get to be designated as Analysts, Consultants and even AVP, rather than Associates or Management Trainees. “This is not surprising” says Professor Nagarani, Chairperson Placements at IFMR, “those with experience are likely to hit the ground running and deliver substantial value to the company within the first year”. This year, several esteemed organizations offered various roles in Banking, Capital Markets, Consulting, Credit, Global markets, Marketing, Modeling, Operations, Payments, Product Development, Research, Risk, and Sales. Known for its policy-oriented research work in development economics and finance, IFMR has successfully created a niche in the management education and is consistently ranked among the top B Schools of the country including CRISIL ratings. 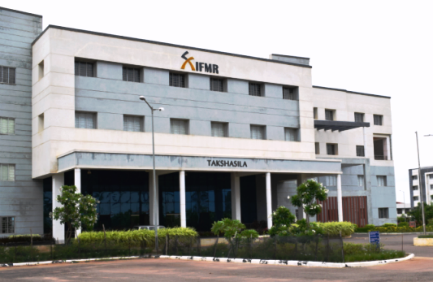 After operating from its Chennai campus for the past four and half decades, IFMR relocated to its new sprawling 40 acre campus in Sri City near Chennai, situated in a global manufacturing hub comprising some of the world’s leading companies. The PGDM programme at Institute for Financial Management and Research (IFMR) has consistently been ranked among the leading Business schools in India. Applications for the upcoming batch 2018-20 are expected to be announced shortly. With the new found status of a University, IFMR shall be offering MBA now instead of PGDM. IFMR shall accept CAT 2017, XAT 2018, CMAT 2018, GMAT & GRE scores to shortlist candidates for final admission round. The cut offs and weightages will be evaluated and the best performance will be considered.